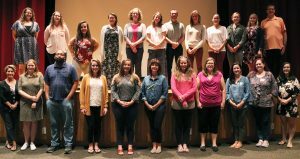 FULTON – The Fulton City School District recently hosted an orientation event for the 26 new teachers that administrators welcomed just in time for the beginning of the 2018-19 school year. New staff members of the Fulton City School District recently attended a two-day orientation event to help them grow accustomed to district policies and procedures ahead of the 2018-19 school year. The two-day event provided time for the new employees to network, receive pertinent personnel information, enjoy lunch with and benefits of the Fulton Teachers’ Association, learn the importance of the district’s literacy and Universal Pre-Kindergarten programs and become acquainted with the district’s instructional coaches. The FCSD school improvement coordinator, director of technology, Pre-K-12 instructional technology coach, director of student support services and director of instructional support services also discussed the importance of their roles in assisting the new staff members throughout their first year and beyond. New staff members at Fairgrieve Elementary School include: art teacher Kimberly Kittleson, special education teachers Mitchel Alpha and Amanda Martin, speech language pathologist Kelly Carsten, psychologist Tamibeth Campbell and elementary teachers Lauren Stall and Amanda Wolsey. Granby Elementary School new staff members are: speech language pathologist Eve Macaluso, special education teacher Lynn Szczygiel and elementary teacher Mikaela Manbeck. Lanigan Elementary School new staff members are: elementary teacher Christina Passucci, library media specialist Jessica Smith and teaching assistant Tammie Parker. Three new staff members at Volney Elementary School are: school home liaison Kelley Sluke and elementary teachers Danielle DeRoberts and Katherine Grabowski, while psychologist Elizabeth Ladd will split her time amongst the Fulton Junior High School and G. Ray Bodley High School. FJHS has also welcomed special education teachers Chynna Barry and Gabrielle Bidwell. Lastly, GRB has welcomed biology teacher Kathleen Sard, English teacher Tiffany Bartlett, special education teachers Alan Bidwell, Lisa Cole and Ena Souza, technology teacher Jason Bauer and teaching assistant Dakota Jones.